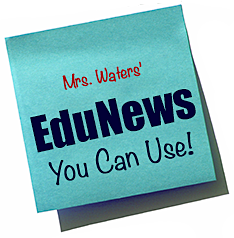 You are here: Home / EduNews / Throw Out The Rewards?! One of my readers questioned the use of Accelerated Reader as an extrinsic reward system on my “How Can Teachers Get Teens To Put Forth Effort” blog post. One of the concerns is that AR’s use of extrinsic rewards raises temporary reading rates, but over the long term, students who have been involved in AR schools are less likely to choose reading when the reward system is removed. She has a point, particularly about the use of extrinsic rewards. While I know a lot of teachers who offer rewards (and I am one of them, obviously, having extolled their virtues) I wonder if perhaps there is a better way. My ideas tend to run short though when I start thinking about those students who lack intrinsic motivation, the ones whom we fret about and design rewards to try to entice into the learning community (but often end up alienating). I have pondered these ideas as I considered Becca’s comments, and then this evening, I discovered a post in which Pernille Ripp, Oregon teacher and author, listed 10 reasons why rewards don’t work. Of course, those reasons raise the question: How do you inspire those students who lack internal motivation to learn? What do you think? Are you for or against external rewards, and why?